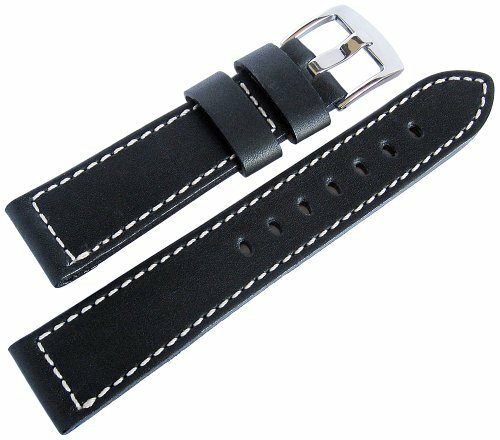 This high quality supple calfskin leather strap is made by Fluco, a German company founded in 1952. Using a meticulous fifty-step process, Fluco produces beautiful leather watch accessories from its workshop in the Bavarian forest town of Furth im Wald. With white contrast stitching and a rugged aviator style, the Snow Calf perfectly suits sports, pilot or chronograph watches. If you have any questions about this product by Fluco, contact us by completing and submitting the form below. If you are looking for a specif part number, please include it with your message. 23mm Navy Blue Grain Leather Strap Watch Band Fits CARTIER SANTOS 100 XL Non-Chronograph by Vintage G.
24.5mm Orange Grain Leather Strap Watch Band Fits CARTIER SANTOS 100 XL Chronograph by Vintage G.